It's just as cute as you probably expected. 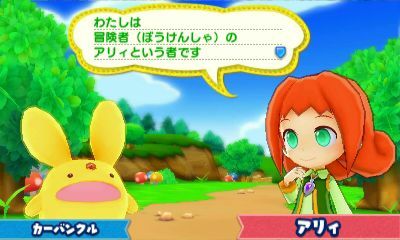 Puyo Puyo Chronicle is the latest game to join the long-running Puyo Puyo series, and it's actually an RPG with several quests to complete while completing Puyo Puyo puzzle games. Sega has finally released some gameplay footage to show off what we can expect to see from the adorable puzzle RPG hybrid going forward. It stars characters Arle and Carbuncle, who find themselves sucked into a strange book and whisked away to a new world where they meet up with a weird girl named Allie who doesn't stop calling Arle a "hero." There's a ton of quests to complete, characters to meet along the way, and more packed into the game, and I'm really excited to see how it turns out, especially with the RPG elements sprinkled within. Check out the first bit of gameplay footage below!